In Outlook 2010's calendar print options, the drop down calendars are missing for the start and end dates. Older versions of Outlook had a drop down arrow with a small calendar that made it easy to select the dates I wanted to include in my printed copy. Now I need to manually enter in the "start" and "end" print range boxes which means I have to seek out another calendar so that I can figure out which dates I want to manually enter. Am I just missing something? No, you aren't missing anything. The date pickers were left out of Outlook 2010. The date pickers were returned to Outlook 2013 but they remain missing from Outlook 2010, even in SP2. It doesn't take a lot of effort to enter a start date - you don't need an exact starting date for the week and month calendars, just a day within the starting week or month. The default start date should be the date you had selected on the calendar before opening the print dialog. If you are printing a monthly calendar, select a date within the desired starting month; you don't need to enter the first and last day of the month. Plus, you can type just the month and day (e.g. 9/1) and Outlook will assume it's the next occurrence of that month (if you type 6/1 in the field on 7/21, Outlook converts it to the next 6/1, e.g. 6/1/2014). The end date can be the day after the start date if you are printing one month (or one week), otherwise, any date in the last month you want printed will work. Weekly formats work the same way: you only need a start a date within the desired week and a date within the last week you want printed. 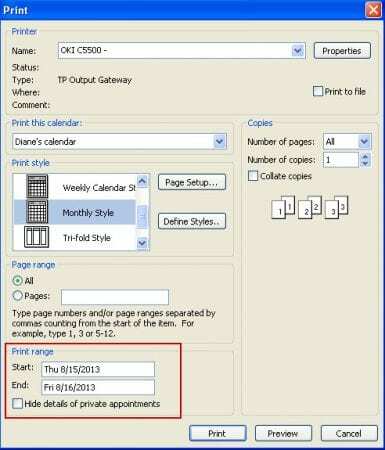 Before opening the print dialog, select your desired dates on the navigation calendar. In Day view, select the first day and then hold Ctrl and click on the last date before clicking File, Print. This will work for Day and Week printouts, as well as monthly printouts, as long as you are not using exactly one month per page. It should say..."click on the first date then hold SHIFT while clicking the last date"
Either will work. When you are printing calendars, Ctrl+Click (normally the keys to pick non-contiguous items) will set the first and last date in the range used in the printout. The original answer said "hold Ctrl to select the first day and then click on the last date". It should actually say "click on the first date and then hold Ctrl while clicking on the last date". Of course, if you want you can try the "IMI Attendees Print". "IMI Attendees Print" has a slightly larger capacity for printing and exporting to Microsoft Office Excel or Microsoft Office Word for example.